After our first weekend at Holiday Market, I'm down at the studio glazing again. I've got five days to get everything ready for next week's firing (could possibly stretch to six, if Denise would watch the booth Saturday. Sunday, though, she's going to Portland for a paper making workshop). Should be manageable; I have fewer pots than usual because so many were left over from the last firing, and I'll have Denise's help glazing incense dragons Thursday. 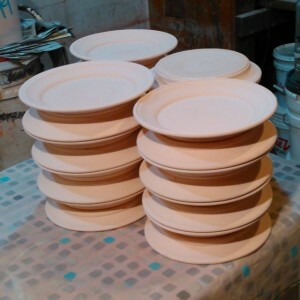 Yesterday I got the biggest items out of the way, pasta bowls and platter, servers and batter bowls. Today I blew through the creamers, stew mugs and tall mugs, and did a couple of special orders. One was rather lovely--a covered crock with vented lid for keeping sourdough starter. 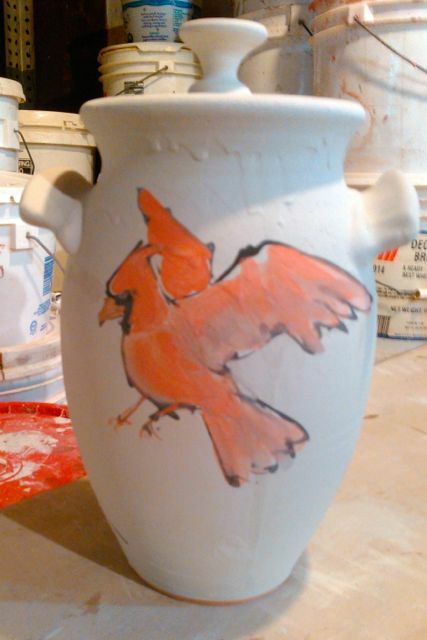 I'd already done one for the customer, decorated with cardinals; this one's for her mom, with Carolina Wrens. The other is rather silly, though I suppose deeply sentimental to the owner: a picture of his old VW Camper/Van, Buster, painted on a set of three mugs. Tomorrow, it's flat stuff: dinner, dessert and pie plates, plus a few covered crocks and butter dishes. Wanted a pic of this large oval platter before I sent it off to its new owner on Whidbey Island. Would really have liked a pic for my Zapp account, but my photographer was busy, and I wanted her to have it before Thanksgiving. To quote the Hidden Almanac, George is an excellent crow. Check out the chihuahua in a bowtie! I love my customers, really I do. Sometimes, though, I just gotta wonder. That's right. A banana slug. On a stew mug. Guess it's a slug mug. Clockwise, from top left, we have killdeer, northern flicker, goldfinch and California quail. It was last month in Silverton when they came into the booth. 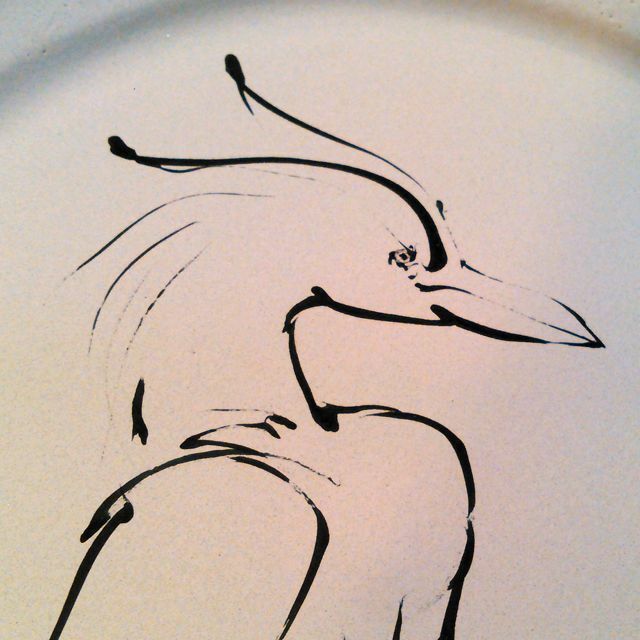 Their twelve-year-old kingfisher platter had finally surrendered to age and use, cracked clean across, and they needed a new one. 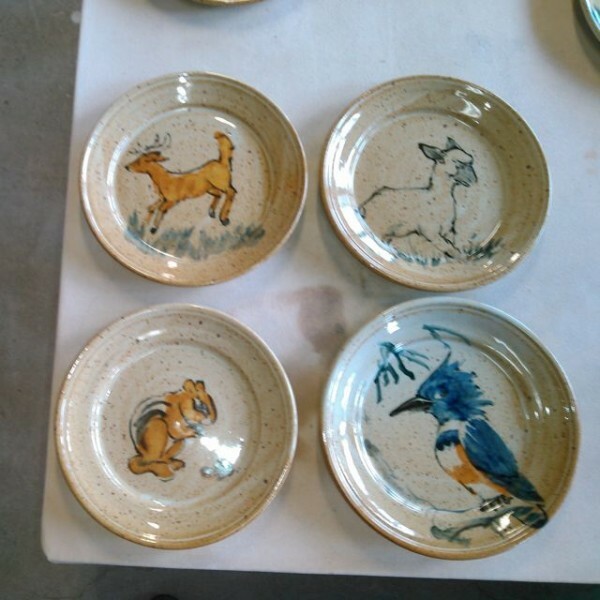 I had only one round platter at all, at the time, a nice one with lions, male and female together, him licking her ear. 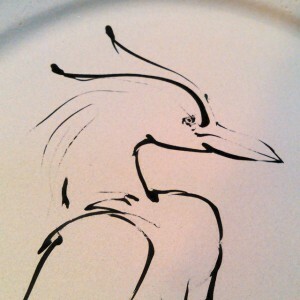 Husband liked it just fine; wife wanted a hummingbird, which I had in an oval platter, but not round. My next firing would be in six weeks (hey, it's a 50 cubic-foot kiln), if they wanted to special order. She did, so I took her card, added her to the special orders list, and in due time called them to say their platter was ready. They arranged for husband to come down to Eugene Friday to pick it up, then rescheduled to Saturday at Market. 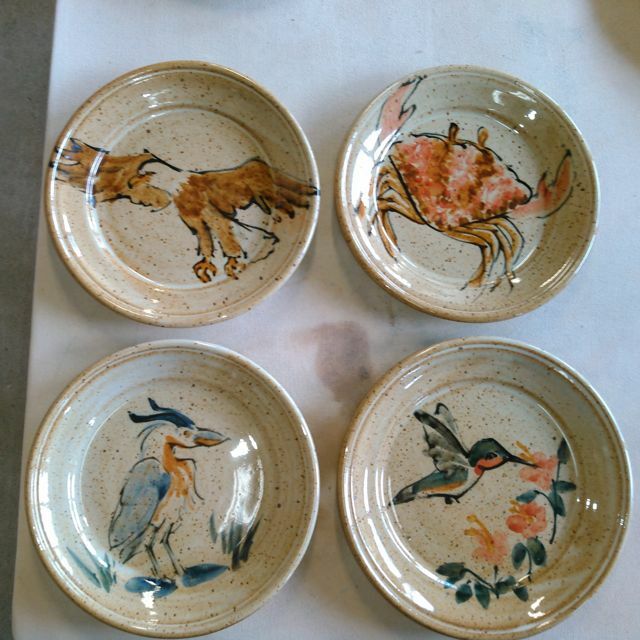 I'd brought the hummingbird, as well as the lion platter; she'd told him to pick whichever he liked better. He took the lions, of course. I peeled off the price sticker, stuck it on the hummingbird platter and set it out in the booth, and wrapped up his purchase. Which he could have had six weeks ago. I've picked out the best-matched set of altar ware for Central Lutheran's order, reconstructed the estimate I promised them and lost in a computer crash, and now I just have to wait for the ladies of the altar guild to come by and tell me what they think. 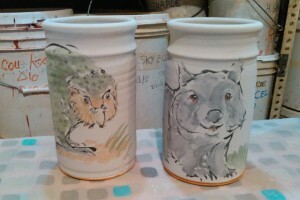 Continuing on the African wildlife theme, here's a pair of mugs for a couple we met in Silverton. If they look enormous, it's because they are. Intended to be 6 inches high and 4 across when finished. 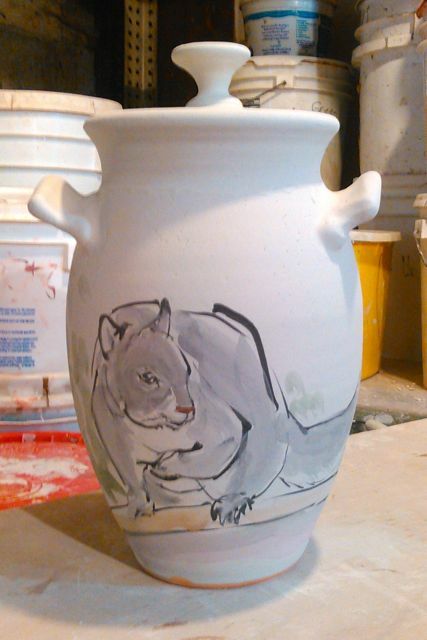 More special orders for my upcoming firing: a set of hippopottery for a hippopotamus collector. I've done things for her before for her own collection; I think some of these are going to a convention. Yes, there are conventions for hippopotamus collectors. Who knew? The chalice set I made for my sister-in-law's ordination isn't the first I've done; I've been making liturgical ware for years. It started back in my Craft Center days, when fellow potter Kathy Lee was approached by her church about doing some specialized ware, chalices with a divided reservoir that could hold both wine and grape juice. The communicant would take the grape via intinction, dipping the communion bread into the preferred side. Kathy had done some altar ware in the past--her late husband Clarence was a Lutheran minister--but really didn't want the assignment, so introduced them to me. 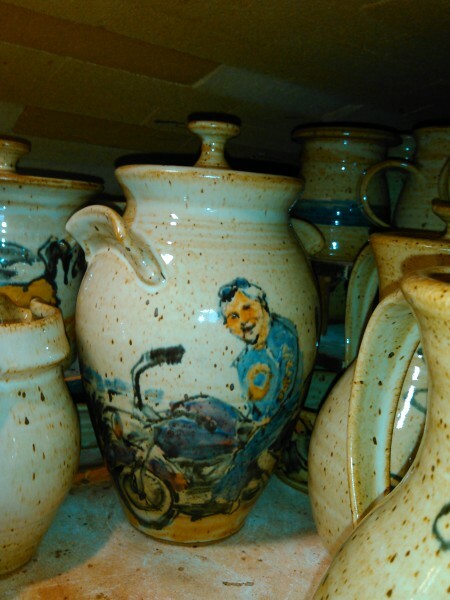 I took a lot of interesting projects back in the day, before Off Center Ceramics started selling regularly: KLCC mugs, Saint Vincent de Paul bowls, a table-top fountain basins for Craft Warehouse. This project was more complicated than any of those. The intinction chalices, which were actually attached to a paten (bread plate) in the manner of chip'n'dip servers, were by far the worst, five different pieces--plate, stem, bowl, extra piece of bowl for the divider, and a sprigged disk in the form of a host, with a Jerusalem cross--that needed to be fitted together at the perfect stage of moisture, else they'd crack apart in drying. I enjoyed the challenge, though, and definitely appreciated the pay: specialized altar ware sells well above the wholesale prices I made for most of the other projects. What I didn't realize was that I'd signed on for a lifetime commitment. Things break, you see. Congregations grow, and the number of service pieces needed increases. New celebrants have new ideas for the design of a particular item. So I've been making chalices, patens, ciboria and cruets for Central Lutheran Church (and also, via their referral, Springfield Lutheran) for a good twenty years now. The latest order is big, and complex. I need to make five large chalices, single-chamber, and three saucer-style patens, to match an existing set. Also a large wine cruet with stopper. I also need to make six smaller, intinction-style chalices--fortunately without the attached paten--and three bowl-style patens, in the same glaze, but on a darker clay body, to match a different original set. Fortunately, I've got a long timeline; they want them for Christmas. Knowing how busy the holiday season is for me, though, I've made and glazed the entire set to fit into my September firing. That way, if anything goes wrong, I'll have at least two more firings to make the sets good. Also did an order for the city of Eugene: employee 5-year mugs. 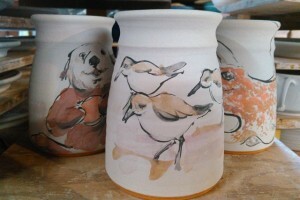 2012 must have been a banner year for hiring, as I glazed 17 of them today. That's a total of 85 years service, which is how long it feels like I've been doing these. I got this letter a month ago, and it still makes me mist up a bit. I wish to thank you for the exquisite ceramic urn you created and decorated for my dear departed husband of 52 years. Your painting of Bob astride his motorcycle is especially appropriate since a few years ago he expressed a desire to be buried on his bike. I told him he would need to prearrange and pay for something as unusual as that and he never did follow through. 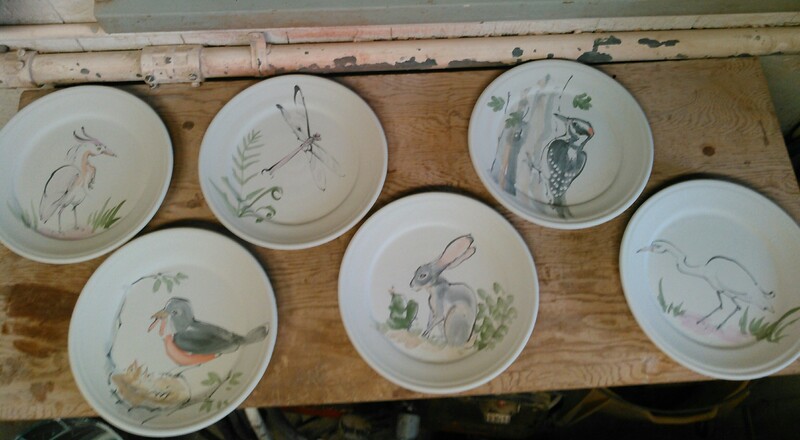 A friend of mine is picking out a set of four dessert plates, and has already decided on bunnies, hen and frog patterns. She asked to see what other patterns I have at the moment that might go with. I've tried twice now to email her these pictures. Both times, using different formats, the pictures have gotten lost between my computer and hers. Somewhere in cyberspace, there's an internet gremlin amassing a nice collection of virtual tableware. So in a last ditch effort to help her decide, I'm posting the plate patterns here. Which do you think completes the set? ETA: It worked! For the record, she chose the eagle. 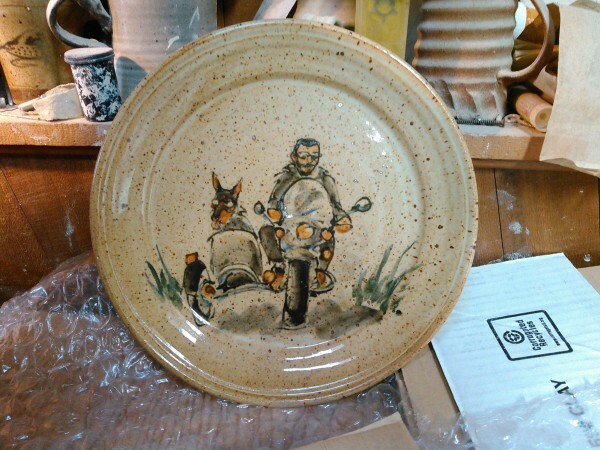 Here's the other cremation urn from this week's firing:"Bultaco" Bob, in his Bultaco t-shirt (it's a Spanish motorbike) riding his non-Bultaco Harley. I'm so pleased with the likeness, and the way the beach scene wraps all the way around the pot. I even managed to get the purple color of his bike right, by layering red stain, a wash of cobalt carbonate over the top, and then another thin layer of red. His sister-in-law is going to be so pleased. The first thing I pulled from the still-too-hot kiln last night was the urn for my mother-in-law Mary's ashes. She'd be so happy; it turned out perfect, just the way she wanted it. I shipped her ashes home from Wisconsin last month, along with those of my father-in-law, Del, snug in his urn. It's the same bird bath, by the way, painted on both pots. It was just outside the front picture window of their Brookfield house. They're together again, side by side on a shelf in our living room here in Eugene. I like to think they'd be happy to be here. I had the best of intentions. I took pictures every day or so. I was going to get back into regular posting after the Christmas hiatus. We can see how well that worked out. It's not all my fault. I lost 10 days flying back to Wisconsin for my mother-in-law Mary's funeral; another 10 days alone back here while Denise continued to sort things out in Milwaukee. And I got into the usual production madness, 100 lbs. or more of clay a day and the trimming and handles and long days. So I totally forgot to document the massive pile of recycled clay--three or four hundred pounds--we produced, before I used it all up. I popped up here once; did a memorial to Mary, then disappeared again. 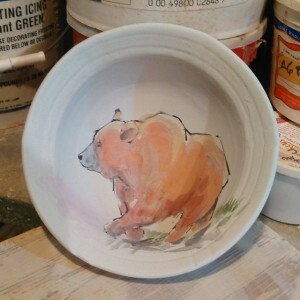 This last week was glazing, down to the studio around 9 or 10 am, leave for home at 5 pm. I took pictures. I really intended to post them. But my cell phone doesn't want to talk to the wifi, and booting the laptop to transfer the files involved actually getting up from where I'd flopped, exhausted, on the couch. Or, you know, bed. So, you get it all at once, in my one day off between glazing and loading the kiln. To start with, I had a lot of tableware. Thirty-some dinner plates, an equal number of dessert plates. Including custom sets for two different clients. I also had four dozen coffee mugs, and another 25 tall mugs, mostly stock patterns, but also some interesting special orders, like otter, octopus, kakapo and wombat. 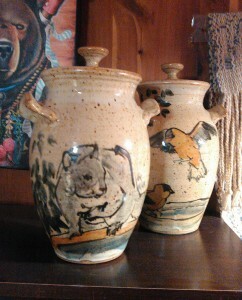 I also had commissions for two different cremation urns. One for Mary--she'd talked about what she wanted on it, squirrel and cardinal, back in October--one for the brother-in-law of a fellow church-goer. 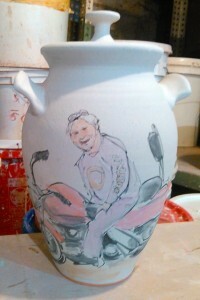 I talked her out of a Harley-Davidson logo in favor of painting him on his beloved bike. 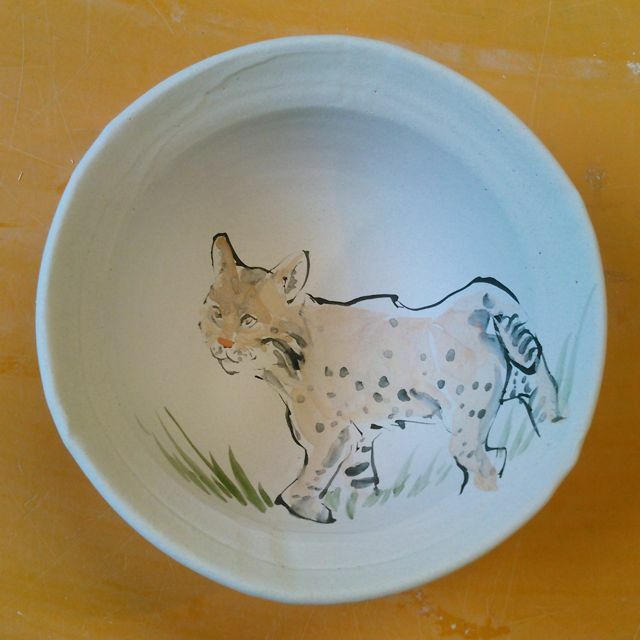 I closed out the week glazing soup and toddler bowls, 59 on Friday alone. 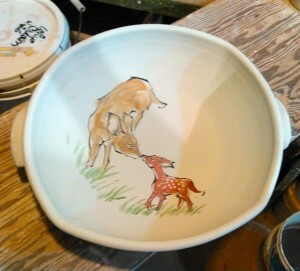 Mostly standard patterns, which go a lot faster; it took less time to do 10 toddlers Friday morning than two each of these special-order soup bowls. I load and fire this week, then spend some time in the office catching up on end-of-year inventory and starting my taxes. And hopefully finding some clever things to say here.